This finished piece of artwork is available for purchase in the ArtNewWave Shop. HERE is the fourth piece of artwork that I’ve created as part of the Words series, my interpretation of simple words into artwork. Like the other pieces in this series (SELF, CALM, and NOW), this artwork evolved along the creative process. HERE was created with the idea of finding your place, in that moment, in a particular place. It also has a deeper meaning, of all of us longing to find that one place that we can find our true self in. 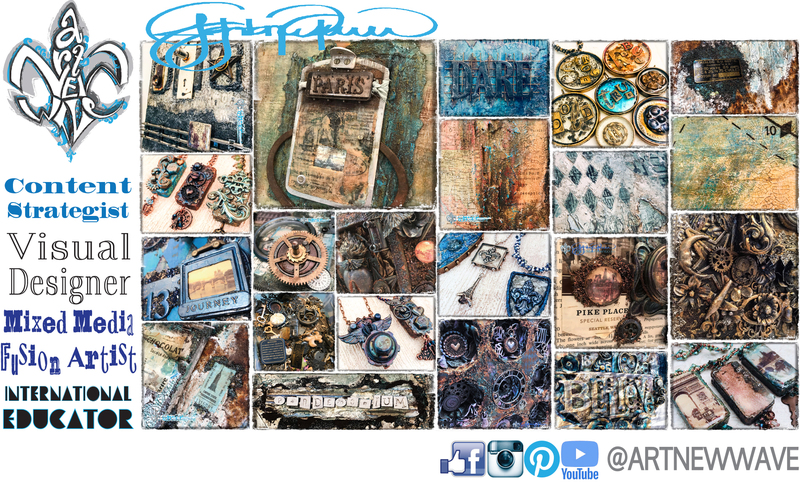 As with many of the mixed media pieces that I create, I allowed the process to determine how this project would evolve. I have always had a fascination with maps and I knew that incorporating an old map into this piece would be a great focal point of trying to find my HERE. To begin the layering of the background, I adhered a piece of torn upcycled cardboard onto the canvas and then adhered the found map onto the torn cardboard. To give more texture to the map, I applied a thick coat of crackle medium over the map and allowed it to dry. I then added a piece of printed newsprint from my stash to the right of this. Once those had completely dried, I began to apply the texture medium to the background, then followed with filling in areas with white gesso to act as the ground for more texture and color. I used a variety of different texture mediums and color washes with acrylic based paints to bring more depth to the background areas. As I played with different techniques, this rusted antique finish began to evolve. I often like to alternate between washes of color and adding more texture – I’ve found that this process adds a dimension to my pieces that can’t be achieved any other way. As with many of my mixed media fusion canvases, I like to carry over the color and texture from the front of the canvas at least over the sides and sometimes carry that over onto the back of the canvas as well. I feel that this gives a more uniform, cohesive finished look and feel to the pieces that I’m working on. Once I felt that I had developed my background color and texture to where I liked it, I began to add some of the elements and found objects to the piece. Most of the time when working on my mixed media fusion pieces, I begin the process by selecting some of my found objects from my extensive collection. As I slowly begin to select the perfect pieces for my project, a theme begins to evolve which generally translates into the base colors and ideas for how the project will progress on the canvas. HERE incorporated some interesting found objects into the piece…In the upper right corner, I incorporated a piece of metal that I found when I parked my car at the local park when taking my dog for a walk. I generally don’t gravitate towards using red in my projects, and when I first picked up this piece of metal I was tempted to just throw it in the garbage for that reason. But being the artistic hoarder that I am, I decided to keep this piece just in case. When I began formulating HERE, this piece just happened to be sitting on my studio table and I decided that it must be fate to use it somehow in this project, which I am glad I did keep it after all! To blend the stark red color of this metal into the rest of the project, I used red metal highlights in the rest of the project. Just like most of my projects, of course I happened to incorporate a fleur-de-lys – this time an upcycled was seal that was given to me by a friend many years ago. And because I love to have hidden details into my projects, I used a small compass into this piece. Since this is part of my Words series, I again used vintage Scrabble pieces to spell out the name of the piece. If you’ve enjoyed this project, be sure to check out the other pieces that are part of the Word series – SELF, CALM, and NOW.